Club Penguin Cheats by Mimo777 Club Penguin Cheats by Mimo777: The Club Penguin Fair Reviewed By You! "I'm really looking forward to see all of the puffles perform at the famous puffle circus! I have spent a lot of time last year watching all of the puffles perform, and I think I am ready to become a puffle trainer this year! I have been training my puffles in my igloo for a very long time now. I really can't wait!" That's awesome, Moon Girl 1! For next weeks review, Club Penguin wants to know what stamps you have found the most challenging, so far? Hmm, I think the most challenging stamps would have to be ALL the ones you have to be a member for, huh? Let me know which one you think is the most challenging, k? Try NEW virtual World for kids! DinoSawUs! I can't wait for the fair. It rocked last year! The most challenging stamp I would say is completing survival mode. Although the hardest stamp I have actually gotten is being an elite pilot on jet pack adventure. I think the hardest one is catching the red fish in aqua grabber. Haha, yeah. The member-only ones are pretty hard... XD And so are the ones that are for nonmembers but require a member item to do it. AWESOME! I love the fair! MIMO! ok at random points the EPF screen goes green and has squiggles and dots on it and in like a minute it shows hidden entrances to the EPF room! they arent ready yet but still... ones to the left of the lighthouse, and ones under a rock in the forest! 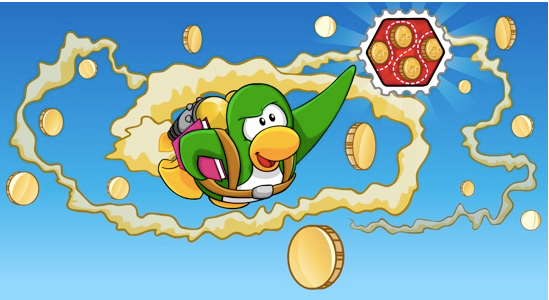 I think the hardest stamp for non-members would be one of the Thin Ice collect the money bags because they only show us 1 so how are we supposed 5. I think that Club Penguin has been very un-fair to non-members. I'm a member myself, but whenever I'm playing a game, and after the first level it has a member icon I get really annoyed. how do you train puffles? mimo777 rember the pick in the book you showed us the room you showed us could be the new room the code from cp game day code unlocks. I cant't wait for that fair. It rocked last year! Totally! I'm looking forward to it, too! MIMO! THERE IS A WAR IN TOOTSVILLE! but i dont know how to pick a team... Can u help? Im SO excited about the fair- its one of my favorite parties (at least annual ones anyway)!!!!! I tihnk this one is hard too! question how long is survival wave?